Sooo, it was a kitchen chemistry experiment of sorts, but I am absolutely thrilled with how it turned out. 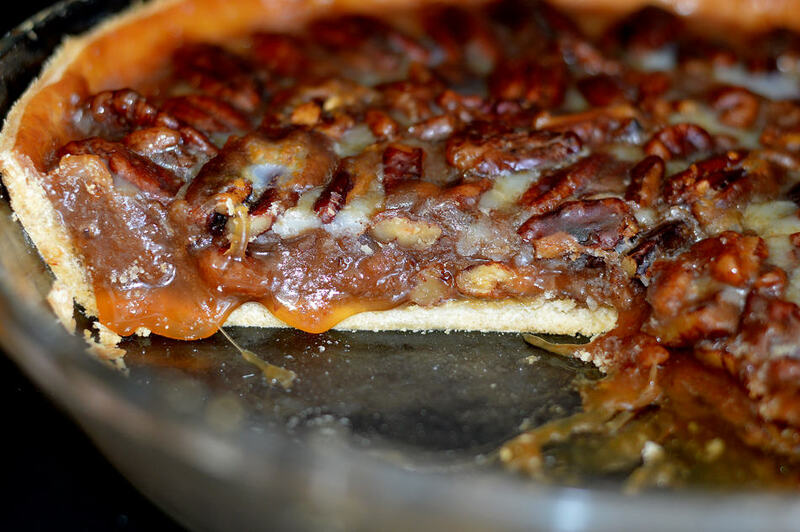 Not only did I take on a Vegan Pecan Pie, but I took on a Gluten-Free Vegan Pecan Pie. If you aren’t gluten-free, don’t worry. I’ll include a traditional crust for you in the printable recipe as well. Today I used Bob’s Red Mill Gluten Free 1-to-1 Baking Flour because it is perfectly formulated for baking with a great taste and texture. But for someone like me, with zero experience in gluten-free baking, there are no additional specialty ingredients or custom recipes required. So that is a HUGE plus. Bob’s Red Mill Gluten Free 1-to-1 Baking Flour combines finely ground brown rice flour, sweet white rice flour, whole grain sorghum flour, potato starch, and tapioca flour with a touch of xanthan gum. Xantham gum is the ingredient which creates chewy cookies and springy muffins. The protein in the sorghum flour helps give baked goods an almost wheat-like texture and aids in browning. You can also use this blend for cookies, cakes, and brownies. The first difference I remembered was that I live in Arizona with pretty near zero humidity. Arrrgghhh, Arizona how you love to mess with my baking! My dough was a bit too dry, but I corrected this in subsequent attempts with another tablespoon or two of cold water. There was also no rolling, this dough is actually pressed into the pie dish and par-baked for 10 minutes. A little bit about flax “eggs” as a replacer. I use these Organic Golden Flax Seeds, also by Bob’s Red Mill. What can I say, I am a fan 🙂 I buy the whole seeds, take out a bit at a time and freeze the rest of the bag. Then, using a spice grinder, I mill them into a fine powder. You can also buy it that way here. The ratio I use is this: 1 egg = 1 Tbl ground flax PLUS 3 Tbl of water. Allow it to sit until it becomes thick and gelatinous. Just like a beaten egg. See, I told you it was simple! 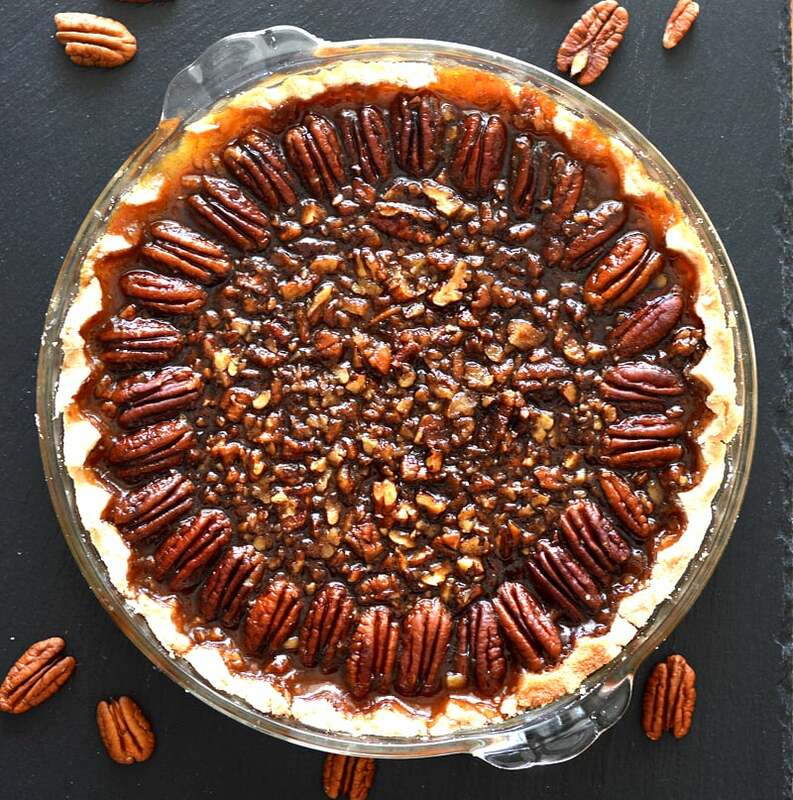 The ingredients rounding up this recipe are corn syrup or brown rice syrup (I use Organic, GMO-free, not high-fructose), sugar, non-dairy margarine, vanilla and the star of the show, pecans. 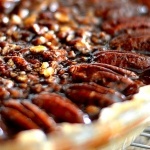 I like to use pieces for the filling and decoratively place whole pecans around the edges. I just think it offers a nicer aesthetic. It’s a decadent dessert, but I know we all understand that everything is better in moderation. Top with a dollop of coconut whipped cream. 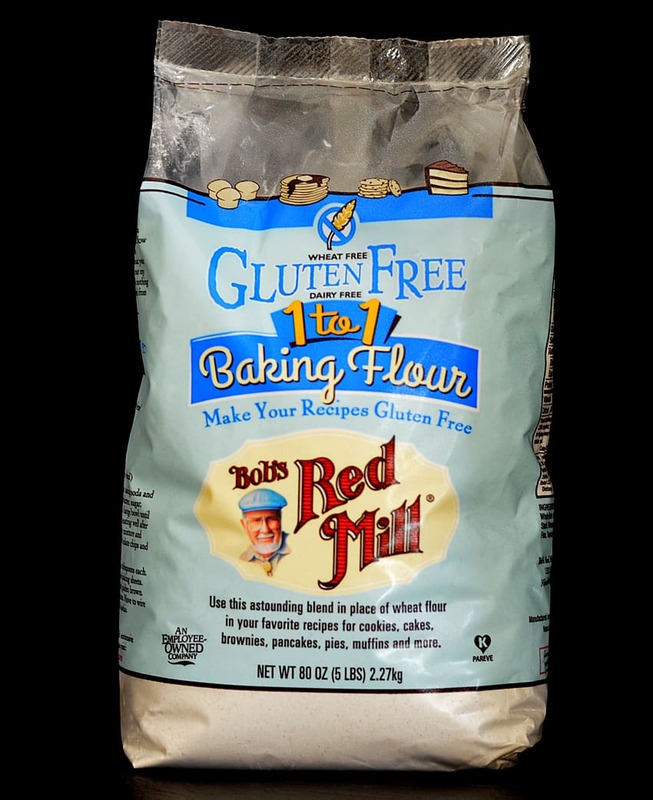 For Bob’s Red Mill Gluten Free 1-to-1 Baking Flour or any other from their line, click here for a printable coupon to receive $1.00 off of your next purchase! Prepare either dough by placing all ingredients (except water) into a food processor and pulse until a coarse meal forms. Add the water, 1 Tbl at a time just until the dough starts to form. Shape into a disk, wrap in plastic and chill until ready to use. 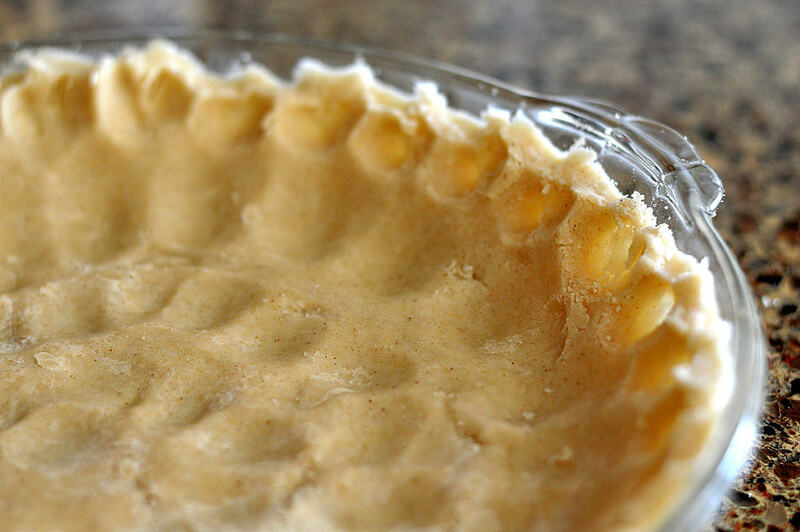 On a floured surface, roll the dough to 1/4" thick and place into a pie dish, crimping edges. For the filling, combine all ingredients stirring to combine. 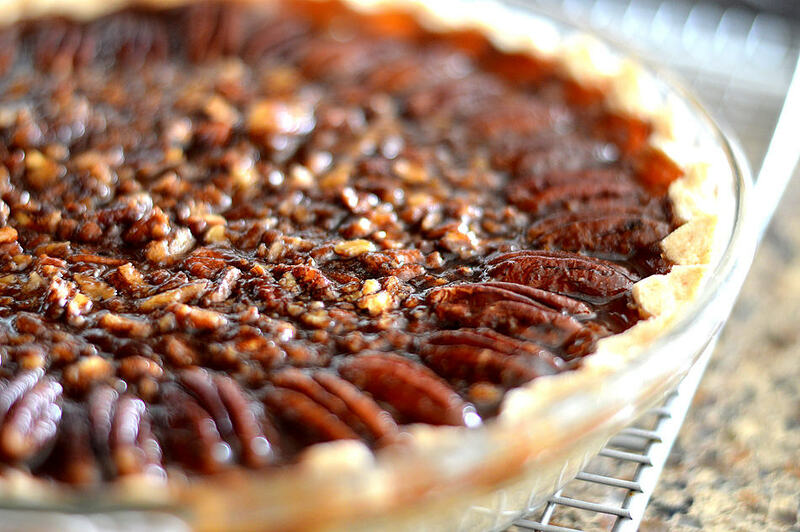 Fold in the chopped pecans at the end and pour into prepared pie crust. Lastly, top with whole pecans, if desired. Bake at 350 degrees until dark, thick and bubbly. About 55-70 minutes. It will still be liquid-y until it cools. It will continue to set until it comes to room temperature. For a clean slice, refrigerate for one hour.